The staghorn patch at Old Blue – shelter for fishes like this little sharpnose puffer. IN 14 DIVE TRIPS TO BONAIRE OVER THE PAST 25 YEARS, one thing was clearly fixed in my mind: you didn’t waste boat dives on sites that were accessible from shore. Like several of my favorites, Old Blue (now called Tolo) and Oil Slick Leap. On my 15th visit in early January, I had a revelation, and perhaps a lesson in looking at things differently. As I’ve gotten older, I realized I had to cut back on shore diving and focus on boat dives to sites around the island. This trip was mostly boats and the comfortable House reef at Buddy Dive. It turned out that when we got on our boat and they asked us where we wanted to go, if we yelled out “Ol’ Blue,” they actually took us there. Luscious reef life at Old Blue. And it also turned out that diving from the boat wasn’t wasting a shore dive – it was a different experience. 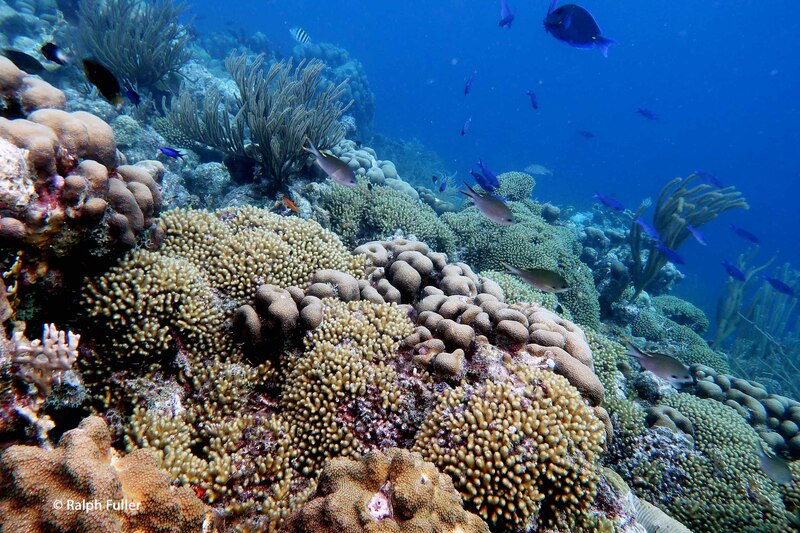 Rather than the dramatic coral slope falling off into the deep, we found a close-in plateau with beautiful landscapes, healthy fish populations and an enormous patch of healthy staghorn corals. 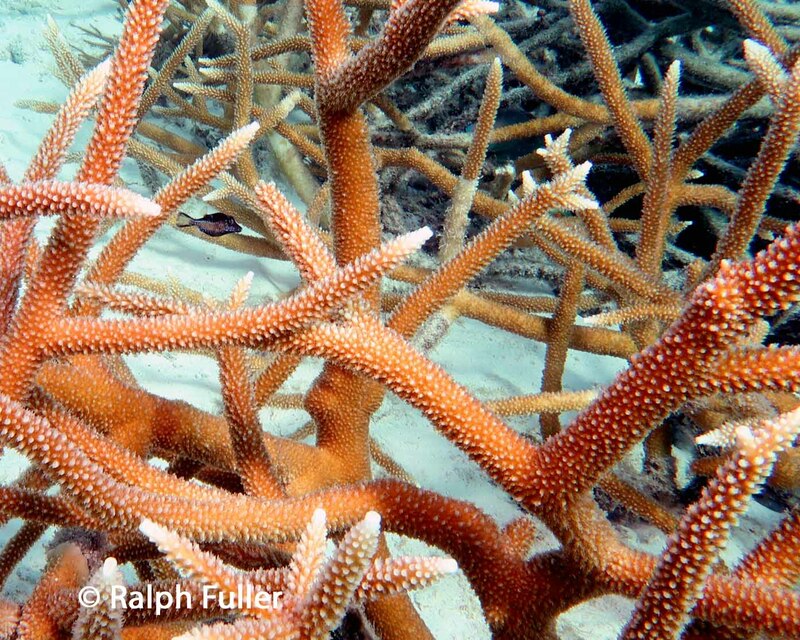 Actually, some of the nicest coral landscapes I’ve seen in Bonaire. Why? Because the boat mooring was far-enough removed from the usual shore- entry spot that we saw a different stretch of reef. We went south against the current as usual, but we were north of the shore-dive entry. The same thing happened at Oil Slick. Old Blue from the shore. Old Blue from the boat. Sea anemone, arrowcrabs and Pederson’s cleaning shrimps – if you look closely! Elkhorn coral on the edge of a dropoff at Oil Slick Leap. Fairy basslets – always hard to capture with sharp images. Juvenile French angelfish, with cardinalfish friend. Smallmouth grunts hanging around a coral aren’t sleeping so much as resting.